"Ultrasound as a long-term, reversible male contraceptive." A Gates Foundation Grand Challenges Explorations grant. Traditionally, men wishing to share responsibility for family planning have had few choices available to them. The long range goal of this project is to provide men with a safe, reversible method of contraception that is reliable enough to deploy in first world countries yet robust enough to use in developing nations. The immediate goals of this Grand Challenges Explorations are to (1) use an animal model to determine the "minimum effective dose" of therapeutic ultrasound that induces a reversible contraceptive effect; (2) begin to determine if repeated use of ultrasound on the testes causes any cumulative damage to the testis and (3) design a prototype apparatus using commercially available therapeutic ultrasound instruments to accommodate future trials in primates or humans, paying special attention to making it inexpensive, simple & robust enough to operate in developing countries. This is a cross-disciplinary project at the University of North Carolina at Chapel Hill involving the Laboratories for Reproductive Biology (UNC) and the Joint Department of Biomedical Engineering (UNC/NCSU). The Laboratories for Reproductive Biology is a division of the Department of Pediatrics in the School of Medicine at the University of North Carolina at Chapel Hill. 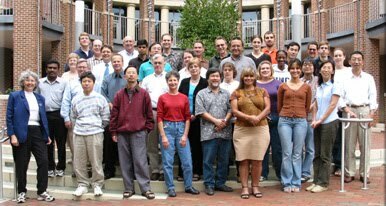 James Tsuruta, PhD., is the Principal Investigator of the project and is pictured in the first row (fourth from the right, grey shirt). The Joint Department of Biomedical Engineering (BME) is an academic department co-located at the University of North Carolina at Chapel Hill and NC State University and was established on December 1, 2003, linking the School of Medicine at UNC-CH to the College of Engineering at NC State. Paul Dayton, PhD., is a co-Principal Investigator of the project and is also the Director of Graduate Studies for the BME department. It was first reported by Fahim and his colleagues in the 1970s that a single dose of ultrasound to the testes with the appropriate frequency and power could result in enough germ cell loss to cause infertility. They reported that depending upon the dosage used, this contraceptive effect could either be permanent or could be reversed after six months. Our goal is to use therapeutic ultrasound instruments commonly found in physical therapy and sports medicine clinics as the basis for a long-term, reversible male contraceptive. Pictured above are an untreated seminiferous tubule (left) and a seminiferous tubule taken from a rat testis two weeks after being treated with ultrasound (right). The untreated tubule contains many developing spermatogenic cells and has a layer of testicular sperm near the small, central lumen. The ultrasound treated tubule is clearly depleted of developing spermatogenic cells, has a large lumen and contains no testicular sperm. celebrating the marriage of Dr. Tsuruta's brother-in-law in Puerto Vallarta, Mexico.